When you had one or two Macs in your enterprise, IT management wasn't much of an issue. But today, with many more Macs being purchased, IT management in a heterogeneous hardware environment requires the same tools that are available for PC. 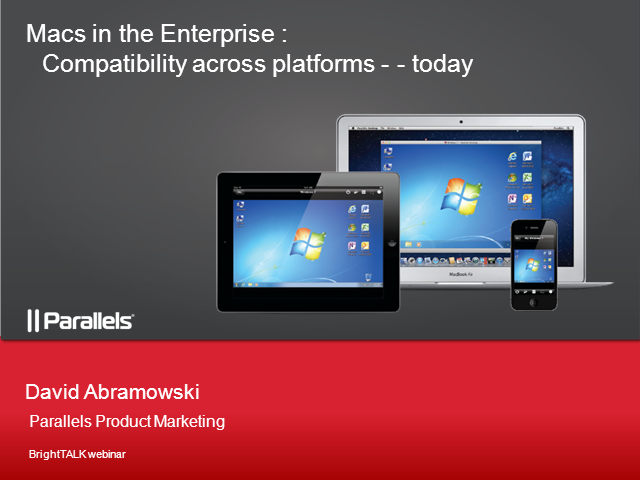 Parallels Desktop for Mac Enterprise Edition provides the solution that IT management needs today to fit into managed deployments, meet change management requirements and fulfill IT compliance needs. In this session, the emerging trends of Macs in the Enterprise will be outlined, and the ways in which Parallels Desktop for Mac Enterprise Edition provides a cost-effective, scalable solution will be detailed.